Sticks and Stones and Styrofoam: The Last Wall At Last! The Last Wall At Last! I ended my previous post with this last lone wall, so it's only proper and fitting to begin this post with the same wall, so that you can follow along on its adventures in the Villa del Vigneto. The wall is destined for the villa's bathroom, which was part of a renovation to the villa many years after the original farmhouse in the Tuscan countryside was transformed into a country retreat for a Venetian family. I wanted a tile backsplash for the bathtub, which extends from the wall into the room. But I didn't want to tile a large area. I finally found a mosaic tile mural of a fountain, which seemed appropriate for a bathroom. I traced the outline of the mural onto lightweight cardboard and onto a piece of cork. Note the "embellishment" for the top of the mural, just to add a little interest. I glued the mural onto the cardboard and cut out the cork frame, adding the embellishment to the top. The bottom piece of the cork frame was cut separately and glued on. To simulate a plaster (or maybe stone) frame, I applied a light layer of joint compound to the cork. I used a makeshift stylus to outline the mosaic tiles in the mural, then added some layers of a gloss finish. Those steps don't actually show up in the photo! I also muted the original colors that you see in the mural - just a bit. 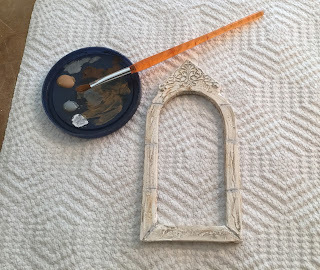 I added some colors to the plaster frame to make it look stone-like. The mosaic tile mural is mounted onto the bathroom wall. I found the perfect mirror in my "mirrors and frames" stash - perfect, that is, except that it was silver. I wanted gold. 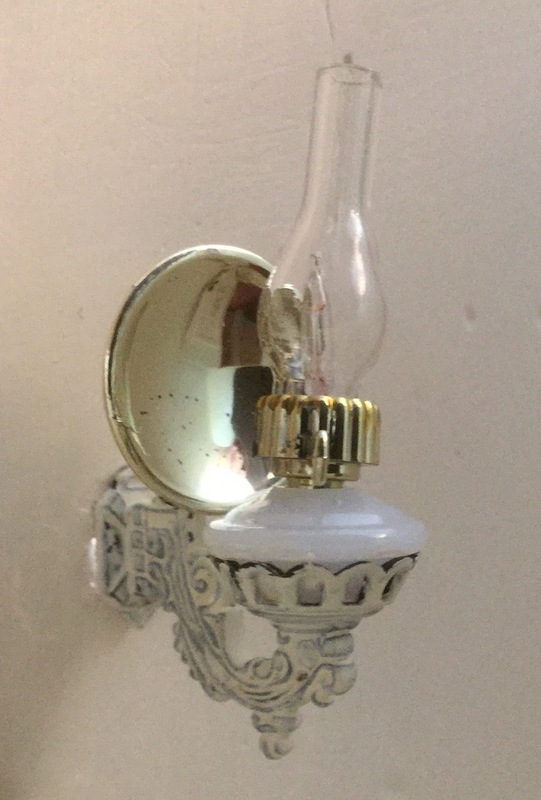 So I painted the mirror gold and added a cream-color wash.
Then I found the perfect pair of sconce lights - perfect, that is, except that they were black and white. I wanted cream and white. So I painted them with a thick wash, so that just a bit of black shows through. The mirror and sconce lights are in place on the wall. The last lone wall is enjoying all this attention! For the villa bathroom floor, I gathered up all the remaining cork coasters in my supply bin. I've used the cork coasters for all the villa flooring. I've found that cork is an excellent building material: light weight, easy to mark, easy to cut, can be used as is or painted, stained, or stuccoed. I like the coasters because of the convenient size, but the cork can be purchased in larger blocks or in rolls. As usual, my first step was to cut off all the slightly rounded edges and mark the cutting lines. The limestone tiles for the bathroom floor are larger than the terra cotta tiles in the other rooms. I applied a light layer of joint compound to the cork coasters. After the joint compound dried, I began the job of sanding - my least favorite of all construction steps. 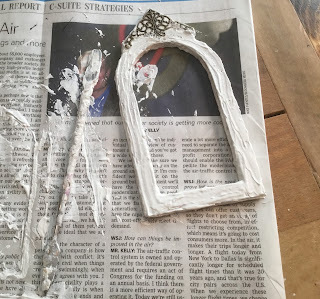 The sanding - for a nice change - went very fast because of the thin layer of joint compound and because I wanted only a very light sanding, in order to preserve the rough texture of the tiles. I painted the tiles with random applications of Antique White, Magnolia White, Pale Golden Brown, Pale Gray, Mushroom, and Yellow Ochre paints and washes. Following the marked lines, I cut each cork coaster into four tiles. I will lay the bathroom floor tiles from the back of the villa (before I mount that last lone wall) for easier access. I have marked the center of the bathroom floor - ready to lay the tiles. This view is from the west opening of the bathroom, which is located behind the master bedroom. Most of the tiles are down - just the edges to finish up. I decided to lay the tiles on a diagonal for variety. View from the west end of the bathroom. The limestone tiles have grown older and more worn since the previous photo! This photo shows a view from the bathroom door down a short hallway to the Master Bedroom, where the door stands partially open. A left turn before reaching the bedroom leads through an arched door onto the stair landing. The bathroom door that leads to the short hallway has been hinged and hung in place. AND - THE LAST LONE WALL IS UP!!! The last wall of the villa revels in its moment of glory! I've run a bead of spackling along the corners and the floor edges. A quick peek from the door of the Master Bedroom, through the hallway, and into the bathroom, where you can see the line of pink spackling in the far corner. All the corners and edges have been retouched with paint. I've temporarily placed some of the basic fixtures and furniture in the bathroom to make sure that everything fits as it should. So far, so good! That last wall will be a busy and functional one. And so we come to the end of the adventures of the last lone wall. But although there are no more walls to raise, there are ceilings to put on and lights to install before the rooms of the villa can be considered complete. And that will be another adventure! Thank you, Betsy, for your complimentary and encouraging comments. I really liked working on the bathroom - and I think it's going to be one of my favorite villa rooms! I'm eager to get it all furnished and accessorized - but it'll be a good while before it's time for that. So this is another exercise in patience! I think that you have captured the essence of an Italian Tuscan bathroom to the "T", Marjorie! I love the coolness of the tiled floor and the clever use of a faux window using the framed tile mural above the tub. Your reworking of the light fixtures and the mirror are BRILLIANT make-overs and have made an Enormous difference to the character of each item. Hello, Elizabeth - I'm happy that you've paid another visit to the Villa del Vigneto, even though it's a bit chaotic right now with all the confusion of construction. I'm a little sad that the interior is almost finished - but a whole different set of tasks are waiting to be done on the exterior, and I'm excited to begin that. I had so much fun working on the bathroom - and there's more fun to come when it's time to "move in." Can't wait! Thanks for stopping by. Thank you for stopping by, Rosa Maria. The villa is the first of my mini houses to have a bathroom, since the others pre-date indoor plumbing - so this was a different and fun project for me. I really enjoyed planning the bathroom, and I appreciate your positive comments! Wow! that is a beautiful bathroom! the floor tiles look amazing...you really have an amazing technique. The tile mural is such an amazing focal point. Bravo on the frame you built. It looks perfect in the space. The mirror and sconces are a very nice touch. Everything works together so well and the room is a lovely size. Well done! Hello, Giac - I appreciate your positive comments on the villa's bathroom. It was a fun room to work on, and I'm eager to see it finished. Sometimes I think the villa construction is moving so slowly, and other times I feel that it's moving too fast. I really want to see it finished, but I don't want to stop working on it! I'd say that the Villa del Vigneto definitely inspires contradictory moods! Thanks for stopping by. Wow your bathroom is gorgeous. I love the flooring and the mosaic mural is fantastic I love how you made the frame for it. You have so many wonderful creative ideas. Hi, Maria - Thanks for visiting the Villa del Vigneto! The bathroom is the first miniature bathroom that I've installed in a house, so it was a fun and unusual project for me. I appreciate that you took the time to stop by and leave such encouraging comments. Come back again! Marjorie, your work is awesome. I'm always impressed at the uniqueness of artist. You have something special. Hello, Lisa - I'm so glad that you stopped by the Villa del Vigneto. Thanks for leaving your lovely comment; it is much appreciated! That bathroom is incredible! Like a spa or a dream! I'm not sure which! LOL Your attention to detail and creativity is amazing as always! Hi, Lori - I'm so glad that you like the villa's bathroom; it's the first mini bathroom I've made. I enjoyed creating it, and I think that it'll prove to be the most fun of any of the rooms. Well, except for the kitchen, maybe. I'm looking forward to all the details involved in furnishing and accessorizing this room. Thanks for your nice comments!